Over 25 years ago, a young Los Angeles County paramedic was confronted with a tricky situation, one that could have easily resulted in a tragic ending. Responding to a 911 call, Steve Islava was faced with having to deliver a baby on site. The problem was that the mother-to-be didn’t speak a word of English and he didn’t speak a word of Spanish. Thankfully, the outcome was a great one and a healthy baby boy was delivered successfully. However, this got this resourceful paramedic’s wheels turning. 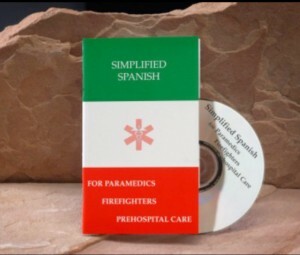 Shortly thereafter, “Simplified Spanish for Firefighters, Paramedics and EMTs” was born – an English-to- Spanish translation booklet and CD specifically geared toward paramedics and firefighters. It contains phrases written in the order of their assessment, only needing a simple yes/no, time or number response, containing key translations such as “empuja” (push) and “respire” (breathe).